Our trek takes the Machame route, allowing gradual acclimatisation to the altitude and an excellent chance of reaching the summit. We pass through thick forest, moorland and scree en route to Uhuru Peak, the highest point. This is a challenging trek at altitude, climbing one of the most impressive mountains in the world. Arrive at Kilimanjaro International Airport; transfer to Moshi town, where we can admire the views of Kibo, the crater at the summit and the youngest of Kilimanjaro’s three volcanic cones. We check in and relax, with time to sort out our kit for tomorrow before dinner and a briefing. Night hotel. One hour’s drive from Moshi lies the gate to the Machame route, where we complete park formalities, meet our crew of porters and start to climb! The first section of the route climbs steadily and passes through magnificent, dense rainforest. This path is less well-trodden so it can get somewhat overgrown in places and it is often wet and muddy underfoot. Night camp: Machame Camp (3100m). Our route continues on up through the forest until we reach the steep ascent onto the Shira Plateau, where there are rewarding views of the mountain. Looking back, you will be able to see Mt Meru rising high above Arusha town in the distance. Night camp: Shira Caves (3840m). Walking now on high moorland, the landscape changes the entire character of the trek. 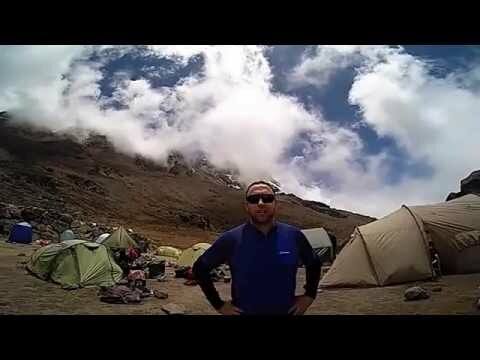 We traverse the southwest side of Kilimanjaro, passing underneath the Lava Tower and the final section of the Western Breach and finally reach camp at Barranco Hut (3900m), a tin shack where we pitch our tents. The day has been spent at altitude (up to 4600m), but we have followed the mountaineering code of ‘walk high, sleep low’ to aid your body’s acclimatisation to altitude. Night camp: Barranco Hut (3900m). Our day starts by descending into the Great Barranco, a huge ravine. We then exit steeply, up the Great Barranco Wall, which divides us from the southeastern slopes of Kibo. It’s a climb over rock, not technical, but long and tiring. Passing underneath the Heim and Kersten glaciers, we head towards the Karanga valley, which is our last stop for fresh water before the summit. Scree now forms the terrain as we walk through arid and desolate land towards camp. Night camp: Barafu Camp (4600m). We avoid walking too long in the heat of the sun today by starting while it’s dark, and walk steeply upwards to the summit glaciers. We will be climbing scree for 4 to 5 hours but gain incredible height over a short distance. The views are spectacular. We should be on the crater rim at Stella Point (5739m) as the first rays of the sun hit us. Spectacular ice cliffs within the crater surround us and the views to jagged Mawenzi – Kilimanjaro’s secondary but more technical peak – and beyond are breathtaking. Another hour’s walking takes us to the summit, Uhuru Peak (5896m); Uhuru means freedom in Swahili. We begin our descent by returning to Stella Point and then descending on scree slope and track back to Barafu Camp for breakfast, before finally heading down to camp for a long well-earned rest. On our descent we have fabulous views of the plains and Mawenzi. Night camp: Millennium Camp (3720m). A gentle trek takes us down through the rainforest to Mweka Gate, where we complete park formalities and receive certificates, which you can hang up with pride! We are then met by our vehicles and return to the hotel in Moshi, where you can treat yourself to a welcome shower (and a cold beer or two!) before our big celebration. Night hotel. We camp in two-man tents; these are usually expedition-style (ie sleeping room only). Camps are usually simple, in remote locations with great views! We have communal dining areas (usually with tables and chairs/stools) and toilet tents, and the local crew look after us very well. We stay in hotels (of a 2-3* standard or equivalent) at the start and end of the trip; standards may vary between different hotels, but they are generally clean and comfortable with good facilities. A trip to East Africa is not complete without seeing some of the wildlife and scenery synonymous with the great open African Plains. We are therefore offering you the chance to unwind on safari after the exertions of your Kilimanjaro trek! We visit the famous Ngorongoro Crater, Tarangire National Park and Lake Manyara National Park, all of which offer stunning scenery and the chance to see the big five: lion, elephant, buffalo, rhino and leopard, as well as giraffe, zebra, hippopotamus and many species of antelope, monkey and smaller mammals and birdlife. You will stay in safari lodge accommodation, on a twin-share basis with good facilities including mosquito nets, solar-heated showers, and local guides and cooks to look after you. The guides are very knowledgeable about the flora and fauna you encounter, and will do their utmost to make sure you experience as much as possible of their wildlife, scenery and culture. This is a great way to fully round off your African experience! The downloadable itinerary gives you an idea of the main regions you will visit on safari, but please bear in mind that your guides will vary the exact locations you go to depending on local conditions and wildlife sightings. The actual itinerary is designed to be very flexible to maximise your time spent watching wildlife. Zanzibar – the Spice Island – conjures up romantic images of clear azure sea, white sandy beaches and fragrant spices. It lies off the Indian Ocean’s Swahili Coast, home to some of the warmest ocean water on the planet. We spend a night in atmospheric Stone Town and have the chance to explore its historic narrow stone alleys before heading to our hotel on the beautiful north tip of the island. Relax on the idyllic beach or arrange your own activities, from snorkelling and diving to dolphin-watching trips and spice tours – the perfect way to relax after the rigours of your trek. Once in resort, this extension does not have an organised itinerary. You are free to spend your time as you wish. Following your Trek Kilimanjaro challenge, a late flight departure allows for free time on the final day of your trip itinerary. For those who would like to take this opportunity to head out for some wildlife viewing, we have created an optional Day Safari in Arusha National Park. Even when short of time, it’s worthwhile to experience a safari when in Tanzania and Arusha National Park offers a huge diversity, easily accessed from Moshi within a few hours. For those who aren’t able to join our Ngorongoro Safari Trip Extension, this is the perfect opportunity to enjoy a taster of the sights synonymous with the great open African Plains first hand. An early morning transfer from Moshi will take you to Arusha National Park for a day of wildlife viewing. The park offers stunning scenery, with views of Mount Meru, lush highland forests, the Momella Lakes and rolling grassy hills. In clear visibility, views of the majestic snow-capped peaks of Kilimanjaro can be seen on the eastern horizon, a poignant reminder of what you’ve just achieved. This park is inhabited by a range of resident wildlife, offering a chance to spot the rare colobus monkey, giraffe, zebra, buffalo, hippopotamus, many species of antelope, smaller mammals and birdlife. Although uncommon, elephants have at times been spotted here too. There’s nothing quite like seeing these animals in their natural environment! You will return to Moshi in the late afternoon. This outline gives you an idea of what you will do and may see on safari, but bear in mind that your guides will adapt according to local conditions and wildlife sightings in the park. Wildlife viewings of all animals cannot be guaranteed. Requires a minimum of 4 people. Please contact us for more details. A once-in-a-lifetime experience. It was extremely hard (especially summit night!) but the team were fantastic, we all bonded with each other and all of the local support crew. An amazing experience. Read more + due to Altitude. Also, chief Guide, Julio, and his 2nd in command, Kaream, were such heroes and so professional. If it wasn't for them, I fear some would have failed the challenge, myself included. Thank you DA for such a life-changing experience. Our DA support crew performed excellently under massive pressure. They deserve masses of credit! Read more + I'd never climbed a mountain of any sort before booking the trip, so there was an almighty sense of achievement. Read more + experience extremely emotional and I am filled with pride on conquering such a monumental challenge. I would recommend Discover Adventure to family, colleagues and friends. The challenge was indeed demanding, however, the excellent tips, support and advice from the DA crew, Jo, Ed, Julio, Henry, Lawrence, Abdullah to name but a few were amazing and really helped us push on through and succeed. It was amazing! Read more + experience will last forever! Read more + all was amazing - not to mention motivational. Our leader was extremely experienced and gave us all the information we needed, and the whole local team of DA porters could not do more. The whole experience has been totally inspirational and I feel I have made friends for life. Thank you. Read more + qualified, highly motivating and highly regarded by the whole group. All in all, top leader, top medic, top guides and top support team, ensuring we got to the top! A brilliant experience all round! But the highlight for me was to see how the local team, 'Ashante tours' operated. From start to finish they were super professional. Massive respect for those guys and our DA leader, Jo and Ed the Med. What a great team! An amazing experience, and one that I’ll never forget! It was very well organised, and I felt safe at all times. I would definitely use again! Exactly the challenge I signed up for! Read more + fantastic experience with amazing support from DA from start to finish. Read more + the whole trip amazing. The UK support was also very good. I’ll be sure to travel with DA again! Rated: 5* Time of my life on a mountain with great people! Our Kilimanjaro trip was the adventure of a lifetime with memories impossible to forget. Dr Phil brought so much joy with his passion for dancing with the porters and Vic kept the smile on our faces. You don't come back quite the same person you were when you left! I knew this challenge would push me to my limits and it did. However, my unforgettable journey to the summit of Kilimanjaro was made possible through the incredible friendships that were made throughout these six days. 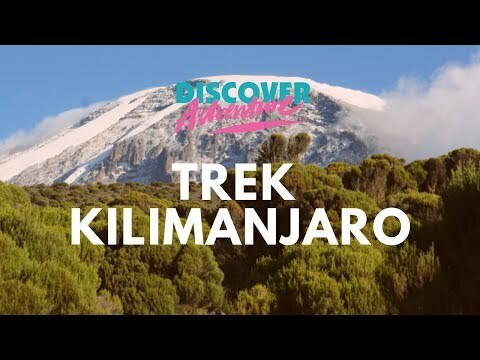 Discover Adventure got me to the Roof of Africa in style, safety and with a smile on my face! Read more + (restaurant quality at 3,000 metres). Vic and Doctor Phil were great – always keeping one eye on the experience and another on safety. They were a delight to spend the week with and at no point did I feel in any sort of danger, despite the challenging conditions. And of course, the admin back at DAHQ was superb. Thanks so much to you and the team there for another incredible adventure. I’m really happy to reaffirm to our event fundraisers that we made the right choice moving all our events to DA. Brilliant as ever. Read more + when you left. Read more + couldn't have wished for a better leadership team for this challenge. They were constantly on hand to answer any questions throughout the trip and their knowledge and support was outstanding. From start to finish, the communication from Discover Adventure regarding all aspects of the trip has been absolutely brilliant and I'll definitely be booking on another adventure in the coming weeks. AWESOME! From meeting at the airport to touching down at home it was 1st class. The DA staff were brilliant, the group were great and the local support crew were exceptional. I couldn't recommend the whole trip highly enough. Brilliant! Read more + without them. They really, really took care of us. Read more + keep strong and focused on something the boots in front. He was constantly checking if I was OK and giving me reassurance that I was going to make it and was there for a big hug at the top to say congratulations! I can't recommend him enough as a leader, he is every definition of the word. He's also the kindest person I've ever known having to get to know him a little personally from his stories. Cath was also a fantastic doctor and was a well-loved member of the group The porters/guides are also a credit to DA - I've never met so many happy, grateful and hardworking people in my life and I'll genuinely miss them very much. Read more + like it! Read more + fantastic and lead the team very well. The local guides were also superb, to celebrate my 34th birthday on the summit morning was something I will neverForget nor will I ever forget the huge birthday cake the guides made for me over 4000m up a mountain on the evening, this was totally unexpected, as was singing songs and happy birthday - it was a great touch and enough cake for second helpings for everyone!The Tanzanian guides and whole team constantly did above and beyond daily, working their socks off to make us as comfortable as possible and you could tell they were so genuine and it was very humbling to witness.The trek was superb taking in different terrains and living above the clouds for so long and I have some great photo's and memories to treasure for life.I would highly recommend the challenge and going with Discover Adventure to friends, family, and colleagues for Kilimanjaro.I would even sign up for it again if the right person or persons asked me if I fancied doing it again down the line.Amazing adventure and experience 10/10. Read more + thinking on my next big challenge!). I have got to give praise to Jo, Lahcen and Rob they worked great together as a team. A huge thanks to Rob as well for helping me when i was ill on the last leg of the journey and helping in every way he could. A very big thank you also goes to the Ahsante crew as without them I;m not sure I would have got off of the mountain. Those guys are amazing have so much energy and always very willing to help. Lahcen was also very helpful when it came to the Ngorongoro Safari extension, it was amazing to see so many animals and the scenery was top notch!! Just what you need after a big hike. I cant fault Discover Adventure from booking at the beginning to getting home, the service has been 100% just like our summit success! Read more + I was hugely nervous beforehand. However, thanks to the expert leadership from Jo and fantastic support provided from Dr Robert and Lahcen, a lot of those fears were put to rest almost immediately.The group got on exceedingly well, and I’ve definitely made some friends for life off of the back of this trip! Ahsante tours also did a fantastic job of getting us up there and back, keeping us fed, watered and sheltered – they are a top bunch of guys and girls.To summarise, thank you so much to the crew, Jo, Bob, Lahcen and to all of you (particularly Sarah and Dan who handled my booking and answered all my questions) for making this one of the most memorable holidays of my life and I certainly won’t ever forget it.Until next time! Incredible trip with great people - I've been back a week and haven't stopped talking about it! The Discover Adventure team supported us throughout and all of the group reached the top which made the experience even more memorable! From meeting at the airport to final day departure everything went smoothly and faultless. The crew and guides were all amazing in their own way and very supportive when it was definitely needed. A wonderful opportunity and privilege to work as a team under spirited and empathetic leadership to achieve a personal goal within very demanding conditions. Great for someone taking the challenge alone as you feel guided from the start of the booking process straight through until you say goodbye at the arrivals lounge at Heathrow after the challenge. Leaders and team were fantastic. Trips are graded Yellow, Orange or Red, in increasing level of challenge. This trip lies within the RED range.